Actions in the energy sector can make or break efforts to achieve the world’s agreed climate goal. Energy production and use account for around two-thirds of global greenhouse-gas (GHG) emissions, meaning that the energy sector must be at the heart of global action to tackle climate change (IEA, 2015). The SAEEC believes that energy is one of the single most important drivers of socioeconomic development and human well-being. Energy efficiency in particular, saves money amidst rising energy costs. It also drives innovative green technologies, supports a cleaner environment and will enhance competitiveness in a world committed to reducing GHG emissions through climate change. Join various stakeholders from the energy sector to understand the policy frameworks and progress of initiatives that link your own efforts towards sustainable growth and prosperity as a professional, business or organisation. Opportunities to make an impact in a burgeoning industry through sponsorship, attendance or exhibiting. 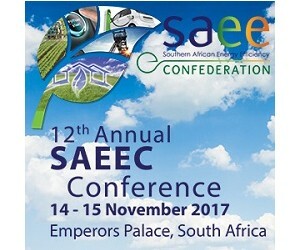 The 2017SAEEC Conference targets the complete spectrum of technologies and services relevant to delegates. The South African Energy Efficiency Confederation is a non-profit coordinating body for energy efficiency in Southern Africa. It is one of 90 chapters of the Association of Energy Engineers (AEE). Our vision is to be the recognised link in energy efficiency for sustainable growth and prosperity in Southern Africa. We believe in the growth and enhancement of business sustainability with a specific focus on energy use. This event offers many sponsorship opportunities to enhance your visibility to a targeted potential client and partnership base, across the energy industry. Choices range across budgets and sponsors can be assured of brand prominence, while simultaneously contributing to energy efficiency knowledge sharing and quality conference attendance. The SAEEC has in place a strategic multimedia marketing campaign including direct communication, paid advertising and online promotions. Our editorials distributed through the SAEEC electronic newsletter and interviews on SAEEC’s Green Hour with Kingfisher FM are very popular. The 2017SAEEC Conference exhibition hall will be packed with decision makers that you and your organisation cannot reach at any other single energy-related event in Southern Africa. Exhibition space is available at affordable rates, with awards and press coverage for the most recommended stands to be presented at the SAEEC’s Cocktail networking event. Guarantee your entity a prominent location by reserving your space now from more than 50 sites.